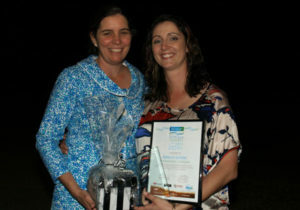 Congratulations to Rebecca Gunther, Beef Extension Officer, on her recent win of the Strong Rural Women’s award from the Queensland Rural Regional and Remote Women’s Network (QRRRWN). Announced at the QRRRWN Conference in Charters Towers on 17 September 2014, Rebecca was recognised for her work in regional Queensland, demonstrating her leadership skills, enthusiasm and commitment to the beef industry. Growing up in a family owned-and-operated beef cattle business and drawing on her prior tertiary education, training and knowledge, Rebecca has built a solid reputation in her role with DAF as a Beef Extension Officer. Rebecca has been with the Department for six years, is based in Cloncurry, and covers around 200,000 square kilometres as part of her role. Through her work with the FutureBeef program, Rebecca is dedicated to helping north west beef producers build viable, sustainable businesses. Rebecca works closely with beef producers on all aspects of their beef enterprise, providing support, access to information, and connecting them to further industry expertise, other industry stakeholders and funding bodies where necessary. She uses a range of extension tools and methodology to inform and guide future research, and connect research outcomes with on ground adoption. Rebecca has been innovative in her role trialling Walk-Over-Weighing and Auto Drafting technologies at the Richmond ‘Producer Demonstration Site.’ She has also built solid funding and project partnerships with Southern Gulf Catchments to deliver the $avannaPlan-Beef$ense property program, enabling producers to analyse and improve their grazing, herd and business management. The Strong Rural Women’s awards encourage all Queenslanders to identify, acknowledge and applaud the leadership strengths our rural, regional and remote women and their contribution to their local communities and beyond.